Geneva, Switzerland, 01 June 2018 – With just a few days to go until MSC Seaview comes into service, excitement is reaching an all-time high among cruise guests, travel agent partners, port officials and the broader industry. 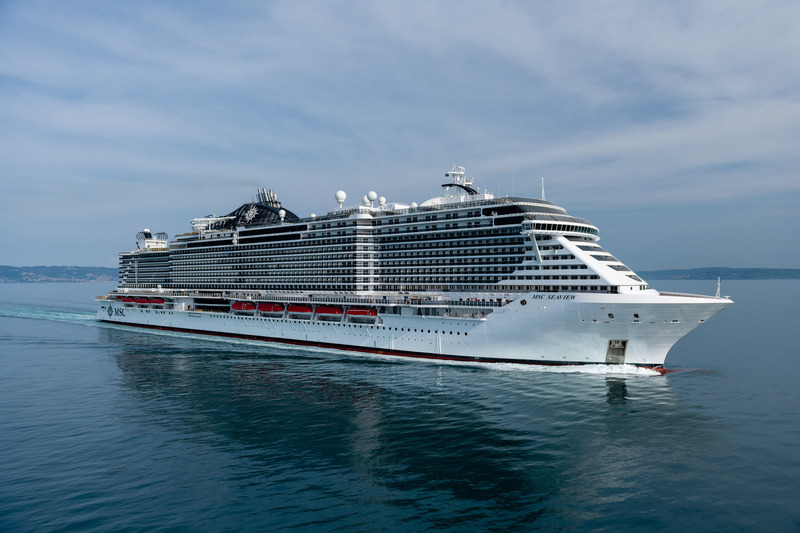 While a nearly 4000-strong team at the Fincantieri shipyard is working 24/7 around the clock to put the final touches and ready the ship for her inaugural season, MSC Cruises today revealed some of the key environment-friendly features on MSC Seaview, the third next-generation MSC Cruises ship to come into service in a matter of only 12 months. MSC Seaview will be one of the more innovative ships at sea, also when it comes to the environmental technology that she will feature. In fact, not only she will comply with the highest international standards with this respect but will also receive from international classification society RINA – in addition to the main Class notations – its “Green Star 3 Design” notation in recognition of the attention that was paid to these aspects during the design and construction of the ship. RINA’s Green Star 3 – the latest and most comprehensive edition of the RINA’s Green STAR additional class notations – specifically recognises that MSC Seaview reaches the greatest levels of eco-compatibility thanks to the relevance of the various innovative measures put in place which help reduce the environmental footprint during operations. These include, amongst others, the exhaust gas cleaning system, the advanced waste water treatment, systems for the prevention of oil discharge from machinery spaces, the ballast water treatment system, and the ship’s Environmental Management Plan. Energy-efficient hull and overall design: For the Seaside Class, of which MSC Seaview is the second ship to come into service, MSC Cruises entirely redefined the hull design, and rethought the ship’s overall distribution of deck space as well as the weight distribution. The ship’s overall design, the hull, the rudder and the bulbous bow are configured to reach optimal hydrodynamics, aerodynamics, and maximize energy and fuel efficiency. Exhaust Gas Cleaning System (EGCS) to minimize sulphur and particular matter emissions: An EGCS removes up to 97.1% of the sulphur dioxide, and greatly reduces particulate matter. In order to meet or exceed increasingly high environmental standards and to support the Company’s environmental objectives, all next-generation MSC Cruises ships come into service already equipped with an EGCS. In addition, ships from the existing fleet are being retrofitted with EGCS technology. By the end of 2020, 13 out of 18 ships in the MSC Cruises fleet will be equipped with an EGCS. The system on MSC Seaview, in particular, has been developed by Wartsilä. Ballast water treatment system: To protect the marine ecosystem in which the ship sails, MSC Seaview is fitted with a ballast water treatment system that complies with the standards set by the international governing body for Ballast Water Management, the International Maritime Organization (IMO). Shipboard Environmental Management: Every ship in MSC Cruises’ fleet has an environmental management plan and every ship employs a dedicated Environmental Officer to make sure this plan is constantly monitored and correctly executed. This Officer also has the duty to instruct and train the crew members on board about environmental and garbage management. Advanced waste water treatment: MSC Seaview is equipped with an advanced waste water treatment system which goes well above and beyond regulatory standards, and meets the high industry standards. The system by Wartsilä/Hamworthy treats waste water to a very high quality and then processes it even further through very fine filtration processes. The end product is high-quality effluent that is of a better standard than most shoreside municipal waste standards around the world. The ship is also equipped with an electronic tool which assists in fully complying with various other local and regional environmental regulations. Trim Optimisation: MSC Seaview is equipped with a software application to monitor and optimise trim in real-time. This technology supports ship officers to keep the vessel’s trim optimized to reduce fuel consumption and optimize performance. Energy-saving LED lighting: MSC Seaview and other MSC Cruises ships use only energy efficient LED and fluorescent lighting. Smart heating, ventilation and air conditioning system (HVAC): This is one of the biggest consumers of energy on a cruise ship, but the system on board MSC Seaview is designed in a smart way to reduce energy consumption. It intelligently distributes heat and cold and is set up to recover heat, for example, from the laundry room, which can be used to warm up the swimming pools or other parts of the ship. 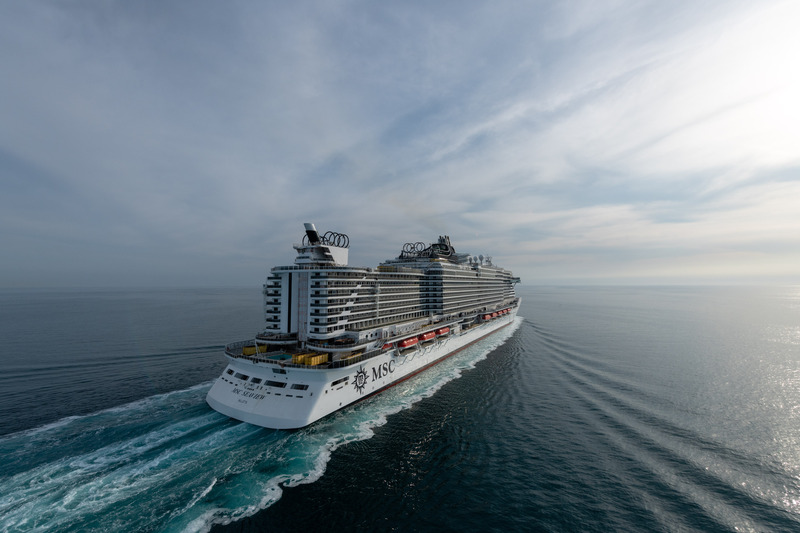 MSC Seaview is the third ship to be built under MSC Cruises’ ten-year, EUR 10.5 billion investment plan which already saw the completion of two out of 12 next-generation ships: MSC Seaside and MSC Meraviglia in November and May 2017 respectively. 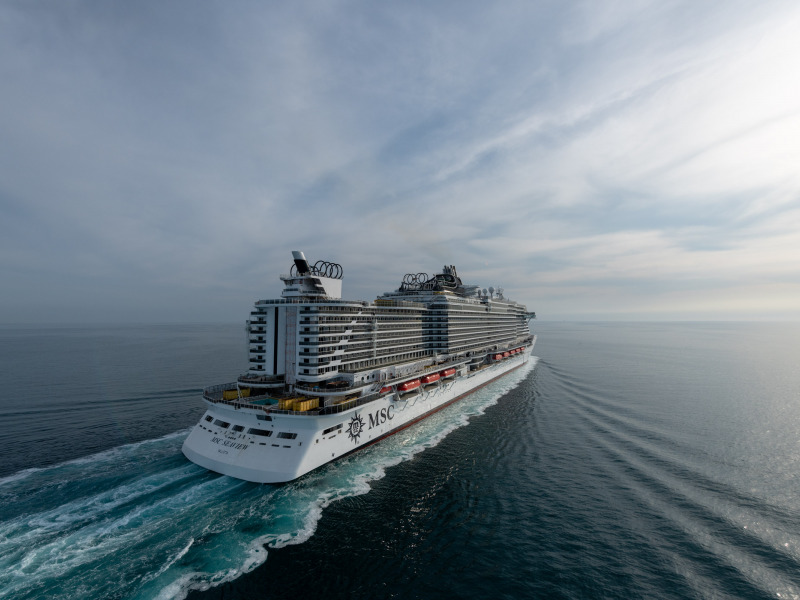 MSC Seaview is the second ship in the Seaside Class and, just like her sister ship MSC Seaside, pushing the boundaries of innovative ship building and design. 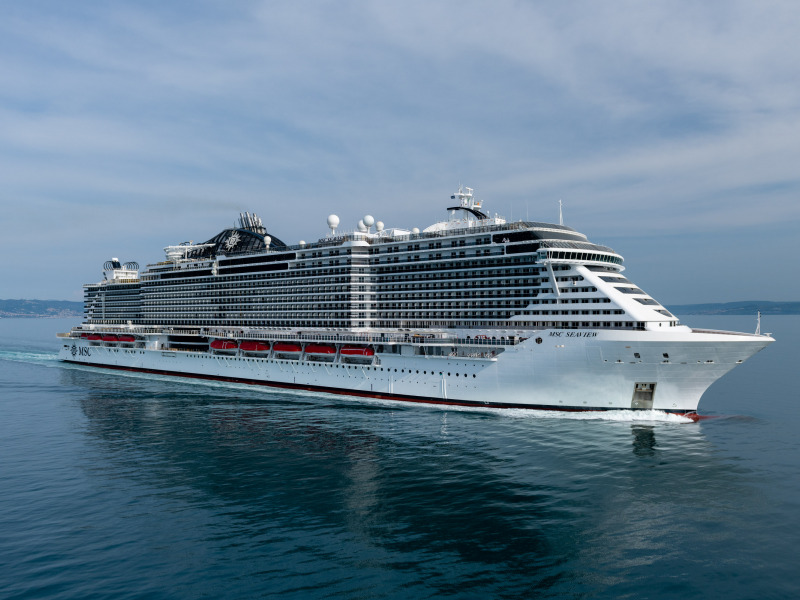 At 153,516 GT and with a guest capacity of 5,331, she is the third newly-built next-generation mega cruise ship in the MSC Cruises fleet and the second one to be built by Fincantieri.